Children's books have the power to influence. They can help a child learn to read. They can bring a parent and child closer together. They can teach a child a concept. They can make a child laugh or cry. I believe that every children's book can influence. The influence may be big or the influence may be small. Trying to wrap your thoughts around all the small influences made by children's books can be overwhelming. It is actually easier to recognize the big influences of a few particular children's books because of the profound change that occurred after their publication. Ezra Jack Keats is an author and illustrator of many influential children's books. My family was influenced in a small way this week when I was able to use his books as the basis for activities with my children. Additionally, his book The Snowy Day influenced the world in a big way by breaking down a barrier with a character that in Keats' mind "should have been there all along." (Ezra Jack Keats Foundation). Fifty years ago, Ezra Jack Keats published The Snowy Day. Claudia Nahson, curator of The Jewish Museum, described the book as "a landmark in children's literature." She clarified, "It was the first time a full-color picture book featuring a protagonist who is an African-American that is not there thanks to a white character. He is not there as a secondary character. He is the story. It is a universal story." (CBS New York). To further discuss the importance of this book, Deborah Pope, Executive Director of the Ezra Jack Keats Foundation stated, "The effect of this book was ground shaking. It opened the door to the publication of many more books about children of many races, but perhaps most importantly; it allowed children of many races to see themselves in the books they read." (Cynsations). I took advantage of a snowy day this week in Ohio. My oldest two children were off at school. I sat down by the porch doors with my youngest son, observed a few leftover snowflakes falling to the ground, and read a book about one of my favorite characters in children's literature, Peter. The Snowy Day, the first of seven books that feature Peter, tells the simple story of a young boy exploring newly fallen snow. I love how the book captures all the things children love about snow -- making footprints, snowball fights, snowmen, snow angels, and much more. Our snow wasn't piled high, but he was able to make footprints, just like Peter. In the YouTube video below, I learned that The Snowy Day was illustrated using collage. To make the snow, Ezra Jack Keats, painted pink paper white. 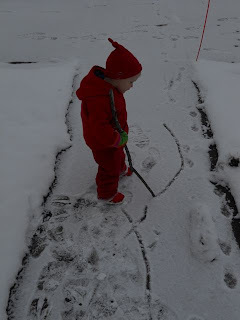 After making footprints, my son found a stick to make tracks in the snow, just like Peter. 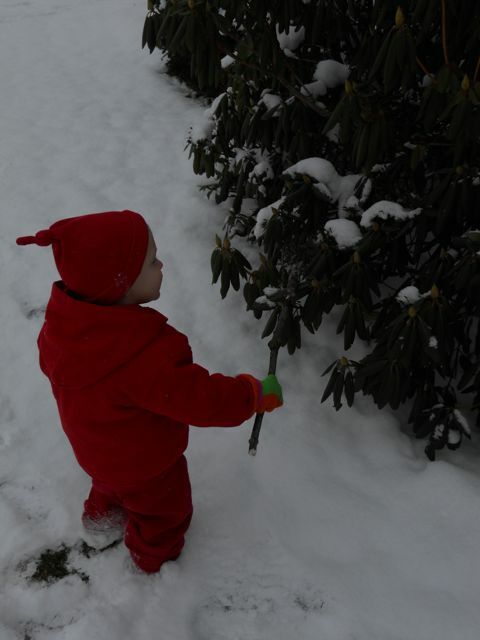 He smacked snow with his stick, just like Peter. Luckily, snow didn't fall on his head. I picked up a handful of snow and packed it into a snowball, just like Peter. We put the snowball in his pocket, just like Peter. He got a wet pocket, just like Peter. 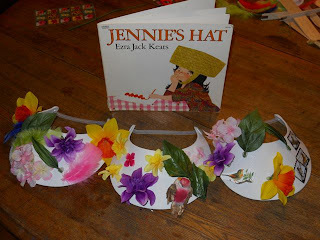 Jennie's Hat is another book by Ezra Jack Keats that I love. 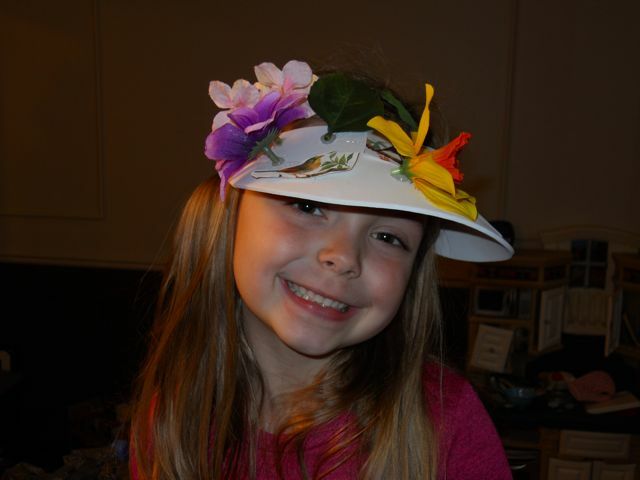 The story is about a girl, Jennie, that is expecting a new hat from her favorite aunt. Her expectations are high. However, when Jennie opens the box she finds a very plain hat. The only thing that gets her mind off her disappointment is to feed the birds like she does every Saturday. However, she quickly remembers how she dislikes the hat and to make matters worse the next day is a church day. She attends church in her plain hat while looking at all the ladies wearing their fancy hats with flowers. To her surprise, upon leaving church, the birds have a plan for Jennie's hat to repay her for all times she spent feeding them each and every Saturday. I have wanted to make Jennie's Hats since the moment I first read the book last year. The finished product exceeded my expectations! Happy Birthday, Ezra Jack Keats! 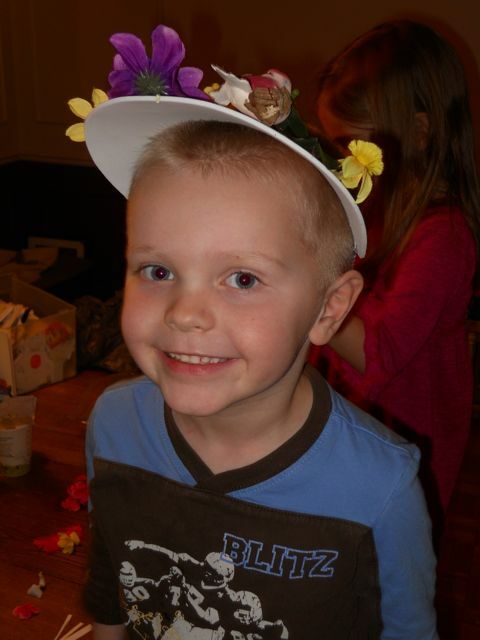 I bought foam visors at Michael's Craft Store for $1 each and about $5 of artificial flowers. I also found colorful feathers and stickers of birds in our craft boxes. My children decided on the arrangement of the flowers on their hat and I used a hot glue gun to make sure everything stayed in place. Her hat is not a "plain hat" anymore. He was such a good sport and he made quite fancy hat. These hats will be "saved and looked at and remembered for a long, long time." I was so excited to learn that the traveling exhibit, The Snowy Day and the Art of Ezra Jack Keats, will be in Ohio from March 16 - June 30, 2013 at the Akron Art Museum. This will make for an extra special birthday celebration next year! Check out the video below for more information about the exhibit! I love the activities you did for both books, but especially The Snowy Day! Wonderful celebration of a wonderful writer! Thanks, Eric. Thank you Beth! He was pretty excited to be Peter! Going out into the snow is a fun activity. I was about to say without a lot of work, but finding the red outfit from his siblings was great! Stacy, I was so excited I was able to pull the outfit together! You never cease to amaze me. Your little guy even has a knot on his hat, just like Peter! I love the hats! Thanks Renee! The hats turned out well. I wasn't sure the visors were going to work, but they did! Eric, what a great post! The memories you're creating__what a gift! Thank you for sharing. Last year, I read A Snowy Day to a group of early learners at one of the schools that uses my literacy program. They loved the book so much, the teachers had to go and get other books written by Keats. This engagement went on for two months. Each week that I visited, I was greeted with collages, homemade books, pic dictations and more! I LOVED it! What a great book! Pam -- What a great story! You certainly inspired those little ones. I find the power of a children's book to be amazing. Keep up the great work you are doing! I absolutely adore "The Snowy Day." 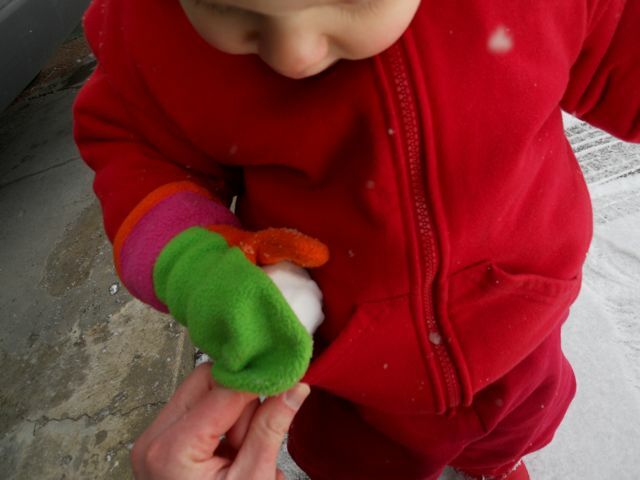 When Peter puts that snowball in his pocket for tomorrow, it always makes me tear up. 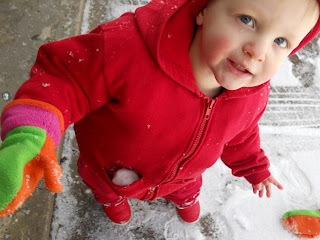 Incidentally, I have three snowballs in the freezer form a brief snow shower we had the other day. Maybe we should pull them out in honor of Keats's birthday. Snowballs in the freezer -- that is a great idea! Maybe we will get one more day of snow. My kids would like to do that. 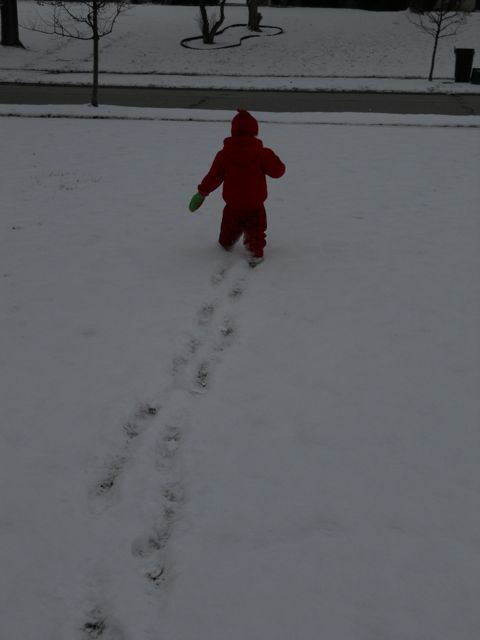 Your son is going to remember The Snowy Day for a long time... this is the best sort of activity I can think of! I just reread this at NY public library yesterday! I do love Keats work! I think he will too. I was so happy that there was a day of snow in between the rain showers and warm sunny days. You have to love Ohio weather! Do your read often at the library? We own The Snowy Day. Unfortunately, the only snowy days we have in our part of Texas are self-made. There was one occasion when it was very cold outside but not snowing. 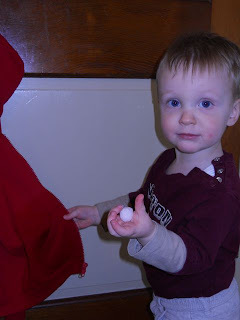 I let my boys to create an indoor snowstorm out of toilet paper. They thought I was the coolest Mom EVER! 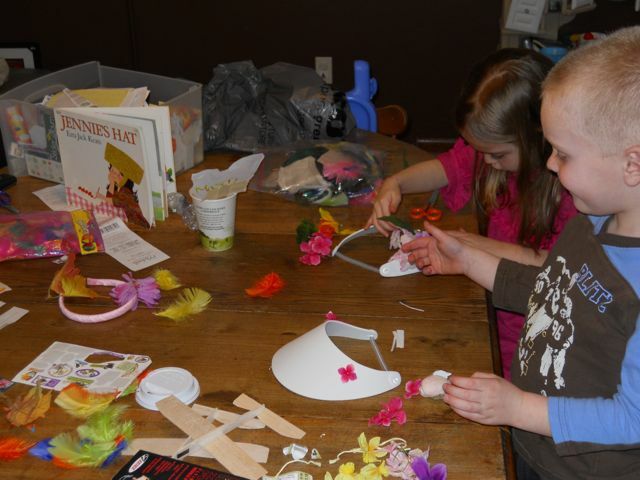 What a huge mess it was--but the fun made the clean up worth it! An indoor snowstorm sounds like a blast! I certainly think you would win the "coolest mom ever" award after that activity! Bravo! "The Snowy Day" is one of my favorite books but I didn't know about "Jennie's Hat." I'm going to check it out. Those are very cute photos-- your kids are so lucky to have you! I was same way until I found Jennie's Hat at a used book sale. It is now one of my favorites by Keats. Thank you so much for visiting the blog! 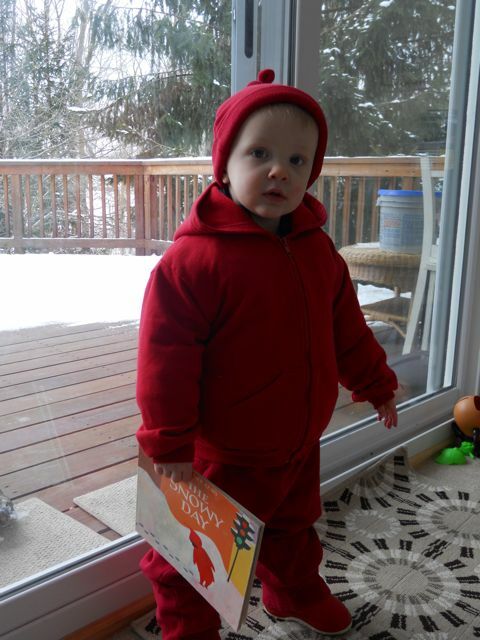 I have my own little Peter doll in his red snow suit that I won at an Ezra Keats 50th anniversary event last November. Thank you for this delightful post. I don't think you could honor his birthday better than this! Little 'Peter' looks just like Papa! Just put Jennie's Hat on hold - thanks for introducing it to me. Just thinking of Snowy Day takes me back to my room growing up! Now I'll have to look up the tour cities for the exhibit in high hopes.